As a midsize SUV, the Flex is a practical vehicle to drive around town. It handles well, and it has low ground clearance so that it's easy to get in and out of. Plus, it has a powerful engine. The Flex, which we carry at Mark Moats Ford, has three rows of seating. With a 60/40 bench in the middle, there's room for up to seven people. With bucket seats, one seat is lost but what is gained is a pass-through to the back row. The third row has a 50/50 bench seat, and it can come with a power-fold capability. If the driver and front passenger want to say comfortable all year, there's the option to get heated and ventilated front seats. This can help with comfort until the climate system can compensate for the extreme temperatures. 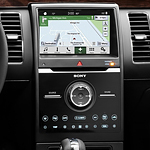 Further, all of the instrument panels and controls have been designed with ergonomics in mind. Everything's in easy reach of the driver.